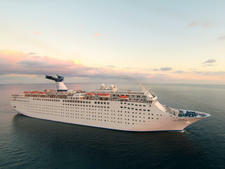 Bahamas Paradise Cruise Line launched in 2015, and its ship, Grand Celebration, is the only one that regularly sails from the Port of Palm Beach, offering two-night cruises to Grand Bahama Island. It's an attractive option for those who don't want to make the trek down to Miami for a short voyage. The quick turnaround time means little commitment, so it's an ideal way to get started in cruising. Another draw is the company's unique cruise-and-stay option that allows passengers to disembark and stay at a partner hotel on Grand Bahama Island for two to six days -- essentially using the ship as a ferry. When Bahamas Paradise Cruise Line purchased 1,800-passenger Grand Celebration from Costa Cruises, few changes were made to the interior of the ship, though the exterior was painted and the funnel was modified. Expect a lively atmosphere onboard two-night cruises to Freeport on Grand Bahama Island. Four dining venues are available, including a buffet that is open late, a main sit-down restaurant, a poolside grill and a specialty restaurant for a $20 charge that features a five-course menu. There's also a main theater that seats 850 passengers, a casino, eight bars and lounges, and a night club/disco. There are age-appropriate kids clubs, an arcade and game room, and a splash pool. The ship has two additional pools, three Jacuzzis, a spa, a salon with a sauna, a steam room and a fitness area. Passengers include many first time cruisers, couples, international travelers, college students and Florida residents on weekend getaways. The average age varies from early 20s to late 60s, with most averaging around 40 to 50 years old. Grand Celebration was first built in 1986 for Carnival Cruise Lines (as Carnival Celebration) and retired from the line in 2008. Following a refurbishment, it began sailing under Iberocruceros, but it maintained the signature Carnival split funnel (albeit with a new paint job). In 2014, ownership was transferred to Costa Cruises. The ship underwent another refurbishment and was slated to join the Costa fleet, but it was bought shortly afterward by Bahamas Paradise Cruise Line and began sailing under the new company as its sole ship in February 2015. The vessel has nine public decks (10 total) and 751 passenger cabins. 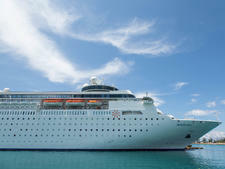 The ship sails to Grand Bahama Island on two-night cruises that include a full day spent in Freeport, Bahamas.